Flu Hits Fourteen Year Record Low – Vitamin D? Outpatient Illness Surveillance — Information on patient visits to health care providers for influenza-like illness is collected through the U.S. Outpatient Influenza-like Illness Surveillance Network (ILINet). ILINet consists of more than 3,000 healthcare providers in all 50 states, the District of Columbia and the U.S. Virgin Islands reporting over 30 million patient visits each year. Each week, approximately 1,800 outpatient care sites around the country report data to CDC on the total number of patients seen and the number of those patients with influenza-like illness (ILI) by age group (0-4 years, 5-24 years, 25-49 years, 50-64 years, and ≥ 65 years). For this system, ILI is defined as fever (temperature of 100°F [37.8°C] or greater) and a cough and/or a sore throat in the absence of a KNOWN cause other than influenza. Sites with electronic records use an equivalent definition as determined by state public health authorities. The peak for this season was 2.415%, just at the baseline of 2.4%. 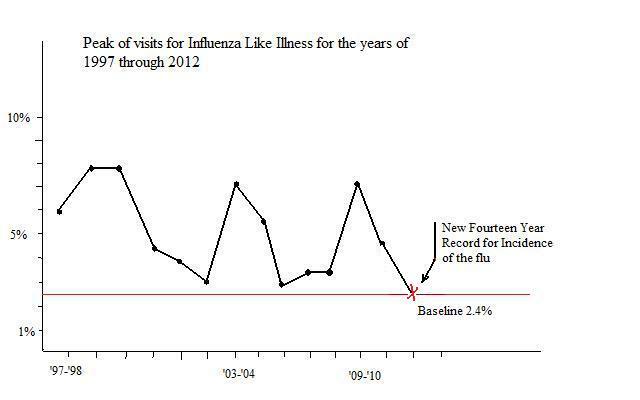 The baseline is defined by the CDC: “The baseline is the mean percentage of patient visits for ILI during non-influenza weeks for the previous three seasons plus two standard deviations.” This means that the incidence of the flu as defined through the outpatient flu surveillance network for this season was like it was summertime, or non-flu season. I believe that the emphasis on the necessity for supplementing with vitamin D has been effective in achieving this fourteen year record. I am sure there are other explanations like the flu vaccine. However, there has been extreme emphasis on the flu vaccine for the last fourteen years without this result. As I have shown in a prior post, the number of people that are now supplementing with vitamin D through survey has been estimated at approximately sixty five percent. If this trend continues, then we can expect lower peaks in future flu seasons. The increase in antimicrobial peptides is very significant with vitamin D. Many articles have been written about vitamin D and flu in the national news. I believe one well written article from 2010 in the Wall Street Journal, “Can Vitamin D Replace Flu Shots” – by Laura Johannes shined a national spotlight as it describes the studies on vitamin D and the flu. Dr. John Cannell, Vitamin D Council, initiated the research showing the increase of the flu in the winter is from low incidence of UV light in the higher latitudes. Lower UV light results in lower vitamin D and viral infections get worse. I suspect the companies that make remedies for the common cold can also tell how their sales declined this winter. If you have kept your serum level for vitamin D above fifty nanograms per milliliter, did you get a cold? The next unexpected happening will be reduction of the ‘big three killers’, cancer, heart disease, and diabetes. The medical profession will make all types of claims when it happens, but you can make a reasonable guess that vitamin D levels in the population are responsible. Who needs a double blind placebo controlled study when thirty million patient visits has shown a reduction in the flu? We are not talking about a drug, but a natural substance, made in our bodies, that is our connection to the sun. This entry was posted in Flu and tagged Record Low Flu Season by Mark Pegram. Bookmark the permalink.